Retired Judge Susan Fornof-Lippencott was honored for many years of service in organizing the DAR annual Constitution Week bell-ringing ceremony. The Urbana Chapter Daughters of the American Revolution met on Monday, Sept. 17, 2018, at 1:30 p.m. in the Champaign County Community Center auditorium, Urbana. In attendance were 15 members and two associate members. A quorum was established. The meeting was called to order by Regent Kim Snyder. Following the Opening Ritual, the Pledge of Allegiance was led by Connie Flanly. Pat Detwiler led the American’s Creed followed by the National Anthem led by Dr. Janet Ebert. President General’s Message: The President General’s Message was given by Pat Detwiler. Highlights included President General Ann Turner Dillon’s reflection on the successful 2018 Continental Congress, sponsor the DAR “Pathway of the Patriots Project” to plant 250 trees in groves along the Schuylkill River from Bartram’s Garden to Valley Forge, and The American Spirit Magazine earning the 2018 APEX Awards. National Defense Report: Judi Henson delivered the report titled “A Leader’s Destiny: George Washington and the Constitution,” which provided the history of Gen. George Washington’s retirement from the Continental Army through his eventual election as the president of the Constitutional Convention. Washington’s support was essential for the ratification of the Constitution and was completed on June 21, 1788. Following the ratification, Washington was then elected for the office of President of the United States of America. He was unanimously elected and remains the only person to have done so. Secretary’s Report: The August minutes were approved as written. A “thank you” note was read from Ohio State Regent Nancy Schirm Wright recognizing the WWI music presented to the 2018 Ohio Society Fall Fun Fair by chapter members, associates and the Cuttahotha Society CAR. Regent’s Report: Regent Snyder welcomed members to Constitution Day. The United States Constitution is one of the primary foundational documents for our nation. This document summarizes the principles for which our patriot ancestors fought and died. Yearbooks are available to those who have paid their yearly dues. Yearbook corrections were given to those present. Regent Snyder thanked hostesses Janice Coates, Susan Gregg and Cheryl Walter. Members were reminded that refreshments do not need to be fancy or expensive. Everyone is encouraged to assist with cleanup following the adjournment of meetings to allow hostesses to fully participate in the business meeting. The Ohio Society Daughters of the American Revolution celebrated the Fall Fun Fair in August. It was announced that Kathy Dixon has been nominated to serve as State Regent. Volunteer Informational Specialist Co-Chair, Susan Linenger, has been nominated to serve as State Vice Regent. Urbana Regent Kim Snyder will serve as State VIS Chair and will be given the task of rewriting the state web pages. Congratulations to the chapter, Dona Tullis, and Becky Shultz were given. If a new name tag is needed, forms are available through Judy Brooks. New member name tags will be purchased by the chapter. Replacement name tags may be purchased at a cost of $15. Regent Snyder reminded members that it is not too early to think about next year’s Continental Congress. If interested, the hotel and bus reservation forms are available. Delegates attending will be elected at the December meeting. National Day of Service is October 11. The Urbana Chapter Daughters of the American Revolution will be participating in the October 27 Honor Flight. Letters written by chapter members to veterans of WWII, Korea, or Vietnam will be distributed on their flight home. The letters need to be mailed to the Dayton Honor Flight before our next meeting. Regent Snyder should have the letters by October 1. Also, the Urbana Chapter will participate in the welcome home festivities at the Dayton airport. We will carpool, but drivers are needed. In order to get through security in a timely manner, it will be necessary to leave around 7:00 pm. Welcome Home signs will need to be made prior to the event. Sign-up sheets are available today. September 29 is the Simon Kenton Hoopla Parade. Tom and Pat Detwiler will provide the truck for the parade. Members are asked to be at the First Presbyterian Church parking lot by 11:00am. The line-up will occur around 11:15, and the parade starts at noon. Members are asked to wear red, white and blue or DAR clothing. There will be a rededication of the DAR forest memorial at Mohican State Park in Loudonville, Ohio, on September 23 at 2:00 pm. Regent Snyder discussed “The Faces of Freedom” which is a virtual wall of the Vietnam Veterans Memorial. This virtual wall has pictures and stories of Vietnam veterans. One person per chapter has been assigned to help in this endeavor. Vice Regents Report: Judy Kathary volunteered to serve as Vice Regent pro temp. Chaplain’s Report: The chaplain’s report was given by Carol Tong. Treasurer’s Report: Treasurer Judy Brooks presented the monthly treasurer’s report as well as the Annual Budget Report. Members were reminded that donations of loose change in the Christian Waldschmidt Barn Fund are most welcome. Registrar’s Report: Dona Tullis reported a membership of 86 members and 6 prospective members. Historian: Historian Janet Ebert commented on her presentation “Urbana University, the Swedenborgens, and the DAR” held on September 12 at Urbana University. An update on the plaque dedication for the gingko and burr oak ceremony to be held at our October 15 meeting was given. Also, Janet reported on the cemetery restoration project. Executive Board Meeting Report: The proposed amendment to the Urbana Chapter Daughters of the American Revolution by-laws was read for a second time and passed unanimously. Members enjoyed a short video of the Christian Waldschmidt Homestead. 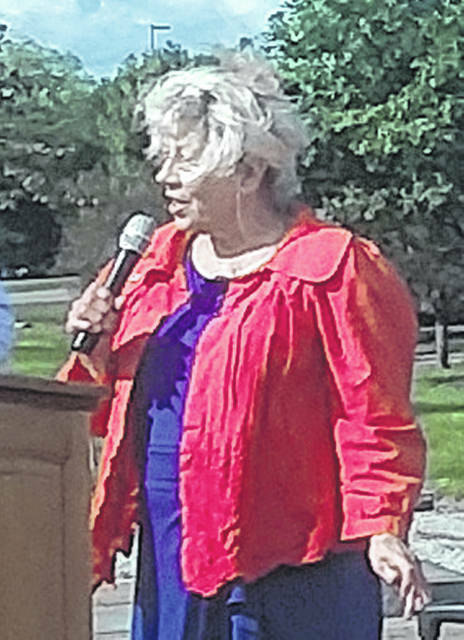 Constitution Week: Susan Fornof-Lippencott gave a report on the Constitution Day ceremony to be held at Freedom Grove. DAR Magazine: Lana Seeburg encouraged members to subscribe to the American Spirit Magazine. Service to America report: Judi Henson stated that as of today 1,473 volunteer hours have been recorded. Eleven members have logged their hours to date. Unfinished Business: Regent Snyder reviewed points received for the 2018 OSDAR Honor Roll. The current balance is at 60 for the Urbana Chapter DAR. The next meeting will be the tree dedication to be held at the Champaign County Historical Society Museum on Monday, October 15 at 1:30 pm. The meeting was adjourned at 3:20 pm. Members then gathered at Freedom Grove for the Constitution Day Celebration and Bell Ringing Ceremony. Submitted by the Urbana DAR chapter.